What happens to a technology junkie when the power goes out? Will the frozen zombified slacker couch potato dude, blink and snap out of it? Will he look for a life outside his TV, gaming, computerized world or is he so used to his desensitized, apathetic state that one voyeuristic box can be replaced with well, yet another unplugged version? 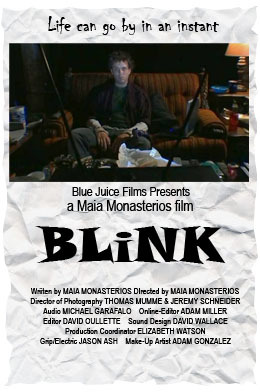 Writer/Director Maia Monasterios brought this quirky little short to the attention of Blue Juice Films back in May of 2005 and over two days in June, using mostly Blue Juice gear Thomas Mumme and Jeremy Schneider Co-DP’d and Michael Garofalo provided audio.